Randel Carlock and John Ward, professors at Insead and the Kellogg School of Management respectively, have studied family businesses around the world and report their findings in a new book, When Family Businesses are Best. The best family businesses excel at two things: balancing emotion and reason; and retaining a long-term perspective. “Families are about love and emotions, and businesses are about making money and accomplishing tasks,” Prof Carlock told me from Hong Kong, where he was lecturing to groups from Asia’s many family-run businesses. ​“These two systems operate on completely different views of the world. So if a family is to run a business they must become ‘professionally emotional’.” Non-family businesses can fool themselves into thinking that they only make decisions based on reason. 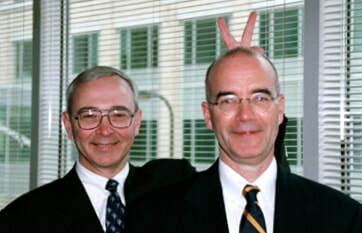 A chief executive can initiate a merger telling the markets it makes hard financial sense, says Prof Carlock, when all along it’s about his ambition. Family businesses do not have this luxury as any confusion between reason and emotion can destroy not just the business but the family as well. Consequently, they are compelled to find ways of acting that are more emotionally mature. Martin's 25 minute interview with Prof Carlock discusses the HQ-Compaq Merger of 2001 led by Carly Fiorina, the lessons for governance structures and processes and the challenges of women in leadership. Could you sack your own son, or give your sister a pay cut? Delivering unwelcome news is never easy for managers – but it is especially difficult for those working for the Middle East’s numerous family-owned businesses, which dominate the private sector. 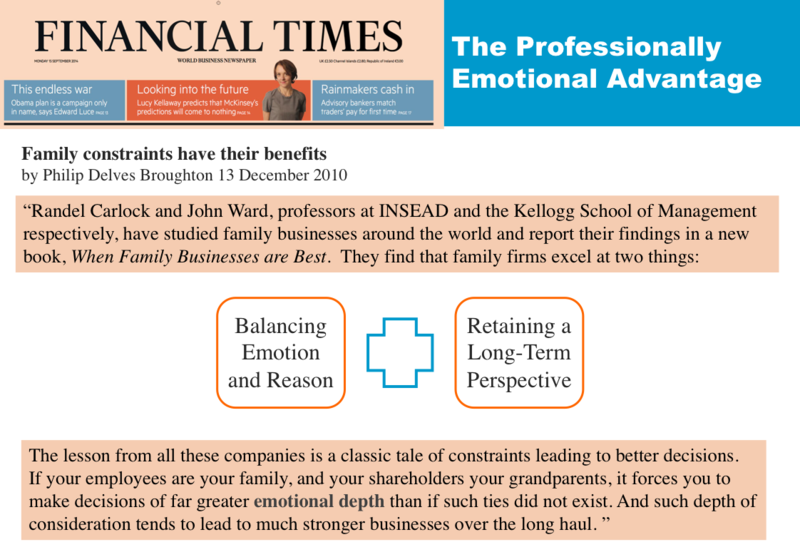 Randel Carlock, a professor at Insead, says family businesses face unique challenges in reconciling the emotions of family life with the harsh realities of the balance sheet. But the co-author of When Family Businesses are Best – who was in Dubai this month with the Entrepreneurs Organisation, a non-profit global network of more than 10,000 business owners – explained why the long-term approach often favoured by family firms can pay off. Why is the management of family businesses an important issue? Because of the overlap of family and business you have a lot more drama. Take Gucci: everybody knows the terrible stories of the sons turning their father in to the tax authorities. When family and business overlap, it creates a powerful story – of both success and potential failures and conflict. When you work for a family business, it’s basically about trying to be professional and emotional at the same time. And that’s something of an oxymoron. The other thing is that the world economy is shifting. Where’s all the growth? It’s in the Middle East, Asia and South America. Those economies are totally dominated by family businesses, so it’s just raised the profile of how important it is to the world. Are family firms run less rationally compared to other businesses? The business side is rationally run. But how can you be rational with your son and your daughter? You love them. Maybe your daughter is really skilled as a business leader, but your son is not quite so skilled … What do you do? Do you leave your son out? It’s a natural conflict. The two critical factors for family business success are clear values that the family agrees on, and strong governance: the family meets together and has a board of directors for the business. If your brother is not performing and if you’ve got good governance, you make that tough decision to move your brother out. How important are family businesses in the UAE? The whole economy is built on family businesses. Sure, you’ll have international firms that come in. But in some parts of the economy, particularly fashion, automobiles – anything that takes a long-term commitment to build the brand and reputation – you’re going to find more family firms. One of the key competitive advantages of family businesses is passion: they care. Very few people go home at night deeply committed to the large public company they work for. But when you work for a family business, even if you’re not a family member, you’re part of the family. It’s one of the reasons that fashion and cosmetics are dominated by families – because you can’t do those kind of industries without passion. But you don’t see a lot of family-owned insurance companies because insurance is really just numbers. Several family businesses in the Gulf are said to be considering IPOs. Good idea? If you need the capital to expand, then go public. But too many people go public for the wrong reason. And the truth is it’s not a very good way to be organised. Wouldn’t you rather be owned by 50 people from the same family who plan to keep the business for generations? Because that is the competitive advantage of a family business: a long-term perspective. Growing on your own capital at a steady pace is a much smarter way to do it. And family businesses have enough trouble keeping their family happy. Why bring in 10,000 strangers? Are there any issues in the way UAE family businesses are run? Their technology is first world – it’s the latest thinking. But sometimes on the family side they’re a little too traditional. Young people need to be empowered because young people have the energy and the new ideas. And this is what makes a dynamic economy. And so I think one challenge in the Middle East is to keep that respect and participation of the seniors, but the energy, motivation and the passion of the young generation. Do family businesses suffer from an image problem? Probably, simply because they don’t do a lot of public relations, and economically most people are fairly naive. Most people do not realise that their Volkswagen comes from a family business … that their Louis Vuitton comes from a family business. And even some family businesses do not realise how important family businesses are. The magazine interviews Professor Carlock about the rigorous but practical Parallel Planning Process and how, in the areas of competing commitments, inter-generational and strategic decision-making, it can be applicable to China’s family businesses. 从家族企业到企业家族 "From Family Business to Business Family"
Randel's latest interview in the IT 经理世界 CEOCIO magazine in China: 从家族企业到企业家族 "From Family Business to Business Family" talks about how the Parallel Planning process addresses the concerns of family businesses today and prepares the family and the business for a seamless transition and successful legacy. Family businesses are discovering a new venue where they can work out their problems: the classroom. For example, a model founded at INSEAD in 2005 helps family members better deal with the ramifications of company decisions, says Randel Carlock, a professor of entrepreneurship and family business at the school. Having one sibling promoted over another, say, may elicit a more emotional reaction than it would in a business that's not family-owned. So companies and families are encouraged to set up objective processes they must follow for all decisions, to eliminate the perception of bias. Of course, the courses come with caveats. First, there's the cost. The price tag can run more than $10,000 per person for week-long programs at top business schools—and that may be prohibitive if many family members attend. Discussions can also get heated, the same way they would around a family dining-room table. Sometimes family members storm out of the room, and tears are not uncommon, says Mr. Carlock. Still, professors insist that they make sure everyone's voice is heard. For instance, at the Family Enterprise Challenge, an executive-education course offered at INSEAD, there's one rule participants have to follow during small-group discussions: Only the person holding the teddy bear can speak. It's a good way for family members to learn how to communicate effectively without interruption, Mr. Carlock says. "The CEOs and the dads want to talk all the time—the real learning for the family is to learn to listen to each other," he says. In a major new survey, Campden FB has compiled a list of the top 50 family business leaders in the world. With the aid of four senior family experts from the world's leading business schools - Randel Carlock from INSEAD; Joachim Schwass from IMD; Kavil Ramachandran from Indian School of Business; and John Ward from Kellogg School of Management – Campden has sifted through loads of data to compile the final list. The top five places went to John Elkann, Azim Premji, Güler Sabanci, Guido Barilla and Ratan Tata. INSEAD business school pioneered teaching in family business. Now most of the big business schools have followed INSEAD's example and offer courses around the family business model. But are MBAs useful to businesses where the founding family member is unlikely to have one? Perhaps you felt a twinge of envy when you read the recent news that Francois-Henri Pinault, 38, was anointed heir apparent at the French retailing and luxury-goods empire his 64-year-old father Francois built, Pinault-Printemps-Redoute. We hope things are going swimmingly for the younger Mr. Pinault, who was elevated to joint managing director of the Pinaults' parent holding company, Artemis, in January, and who declined to be interviewed for this article. But contrary to the popular myth that sons, and yes, daughters, get all the breaks in family businesses, being a member of the so-called next generation can be a total nightmare. Imagine you always wanted to be an architect, but Dad threatens to disinherit you if you don't join the family business, says Stuart Makings, a partner at PricewaterhouseCoopers, which operates a family business consultancy from Leicester, England. So you buckle. But then Dad, a control freak, treats you like you're hopeless, and constantly reminds you how much harder it was for him starting out. When you remodel your office, he makes you change it back, Mr. Carlock says. The pits, adds Mr. Carlock, is to have a job you don't deserve. "It's got to be frustrating . . . You know everybody behind your back is saying the same thing, that if your grandfather hadn't launched the company, you wouldn't be there." Why would anybody ever want to do it?